When obtaining self-storage financing, it’s crucial to understand the capital markets and how to secure optimal terms. Get insight to markets and lending sources, as well as best practices to acquire funds. When it comes to obtaining self-storage financing for an acquisition, expansion, refinance or new development, it’s crucial to understand the capital markets and how to secure optimal terms. 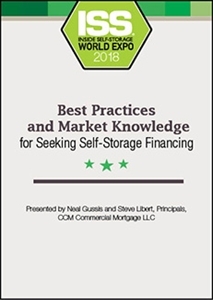 Our presenters will provide insight to these markets and lending sources in relation to the storage industry, as well as best practices to secure financing and case-study details from actual deals.